Oklahoma's Aaryn Ellenberg was one of six Americans to score in double figures and Sherri Coale earned her first win as a head coach of a USA Basketball team Monday at the World University Games. Ellenberg scored 11 points in 14 minutes as Team USA defeated Mali 120-32 in the opening round of pool play at the world's second-largest international athletics competition, hosted in Kazan, Russia. Ellenberg made four of nine field goals, including one 3-pointer, and two free throws as the United States routed the West African country. 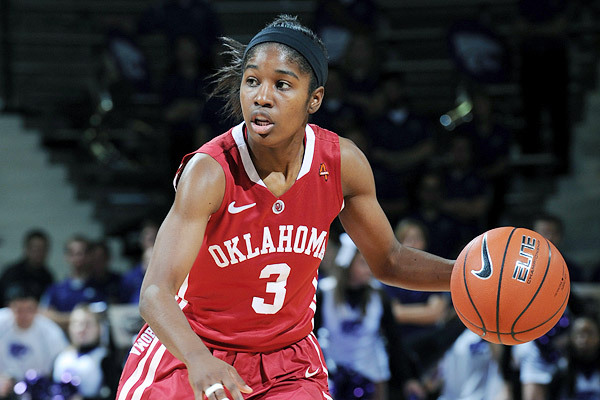 The Sooner senior-to-be also recorded one rebound and one steal. Team USA made 47 of 71 field goal attempts, including 11 3-pointers, and dished 34 assists in a balanced effort. Mali made just 12 baskets and was held to 19 percent field goal shooting. "We got out in transition, ran really well, and Shoni Schimmel sort of opened the flood gates for us with her passing ability when we had advantages in transition offense," Coale said. "And just every day that we play together, we get a little bit more comfortable with one another. The chemistry was better, and we communicated better on defense. Every opportunity to log minutes on the floor together as a unit makes us better." Coale's squad led 28-12 after one quarter and 57-20 at halftime. Team USA outscored Mali 37-8 in the third quarter and 26-4 in the fourth. "It was a relief," Coale said of the opening win, "and I think they were relieved to have success with one another. They really seemed to enjoy making one another look good, which was fun to see, and it's going to have to be our M.O. throughout this tournament. And so it was neat to see all of the assists, and the selflessness on the floor, and the team work and the championship behavior. Lots of intangible things really grew over the course of this game." The World University Games are held biannually and are organized by the International University Sports Federation (FISU). The World University Games is a multi-sport competition open to men and women who are between the ages of 17 and 24 (born between January 1, 1989 and December 31, 1995), and are or have been within the past year, a student at a college or university. USA Basketball women's teams have participated in 16 prior World University Games and collected a record eight golds, six silvers and one bronze medal. Further, since 1973, the first year the USA women competed in the WUGs, the United States has compiled a 96-15 record. The United States is the defending World University Games champion. Team USA will face the Czech Republic at 11:30 a.m. Tuesday and Brazil at 3:30 a.m. Wednesday to complete preliminary round play.